In this chapter we will connect the components placed on the canvas. In the first project, you learned how to use individual wires to connect the pins of the components, manually, using the W key. 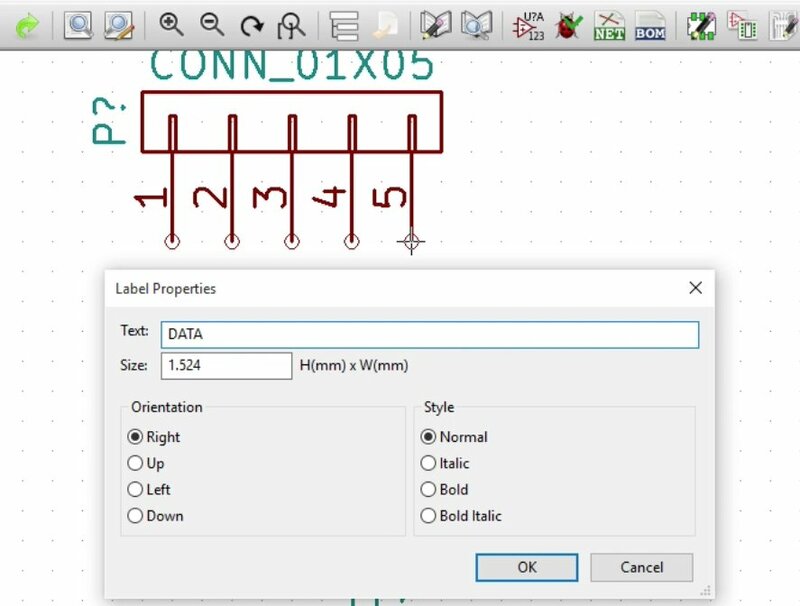 As your schematic becomes larger and more complicated, this method of wiring will increasingly produce schematics that are difficult to read. Too many wires will be going to too many places, criss-crossing each other, and increasing the chances of errors. 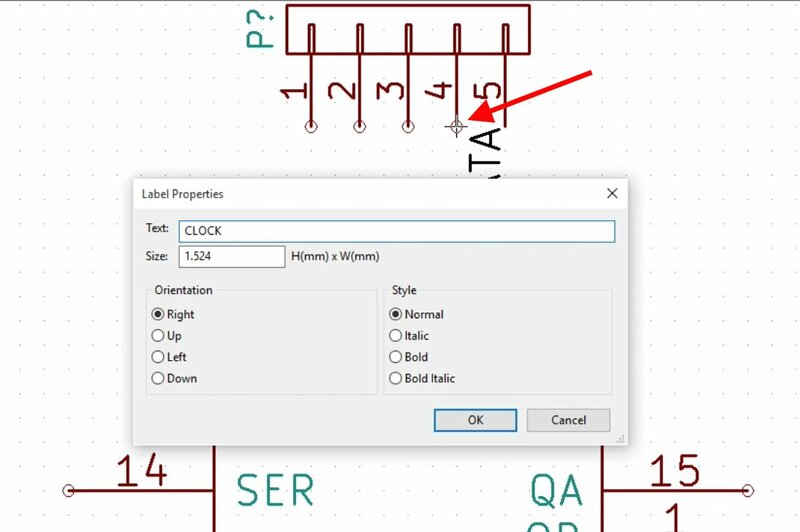 In this chapter I will show you how to use labels with which you can mark pins and logical connect them, without having to draw an actual wire. Let’s work on an example to demonstrate. Let’s do the wiring for the Data pins. To add a wire label, click on the A key. To add a label, click on the A button, as I show in the image above. Then, click on the wire that you want to label, in this case it is the pin 5 of the straight connector. This will produce the Label Properties window. Type in the name of the label, “DATA” and click OK.
Once you are in label mode, click on a wire and give a name to your new label. The new label is attached to the wire. You may need to rotate the label to align it. 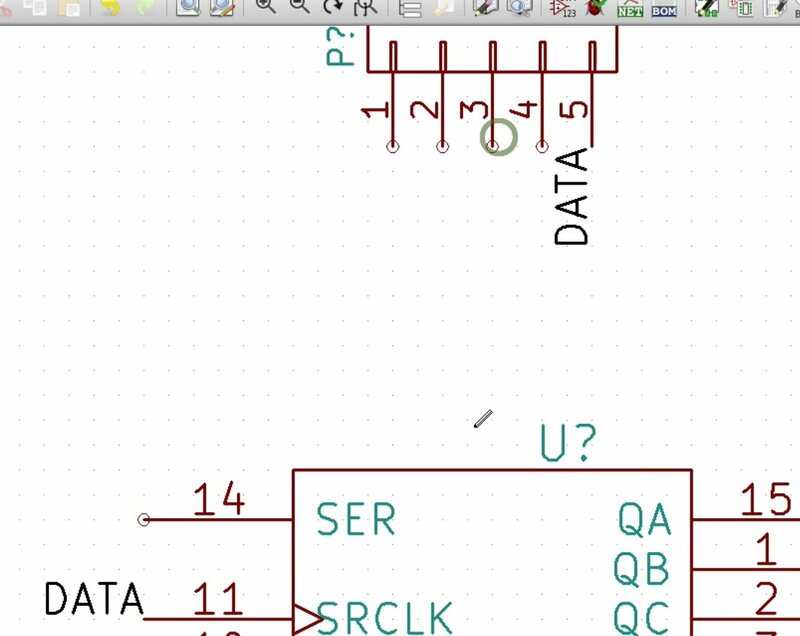 On the shift register, the pin where the data from the Arduino will arrive is number 11. Add a new label, also with the name “DATA” to pin 11 of the shift register. And again, rotate it if needed. Attach a new label, also named “DATA”, to pin 11. Now, pin 5 of the connector and pin 11 of the shift register are logically connected, without a need for an explicit wire. 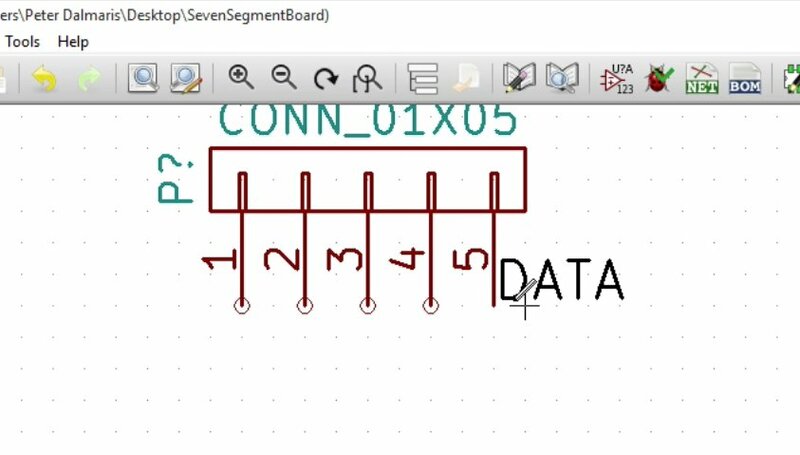 Now KiCad knows that pin 11 on the IC and pin 5 on the connector belong to the same net, so they will physically be connected in Pcbnew. You can also confirm that there is an actual electrical connection by doing an ERC check. The ERC check will show that indeed pin 11 on the IC and pin 5 on the connector are connected. Let’s add another two labels. Label pin 4 on the connector “CLOCK”. Take care to use the “R” key to rotate the label, and to attach it to the end of the pin 4 line indicated by the small circle. Pin 4 of the connector is labeled “CLOCK”. Take care to attach the label on the small circle that marks the end of the pin 4 wire. 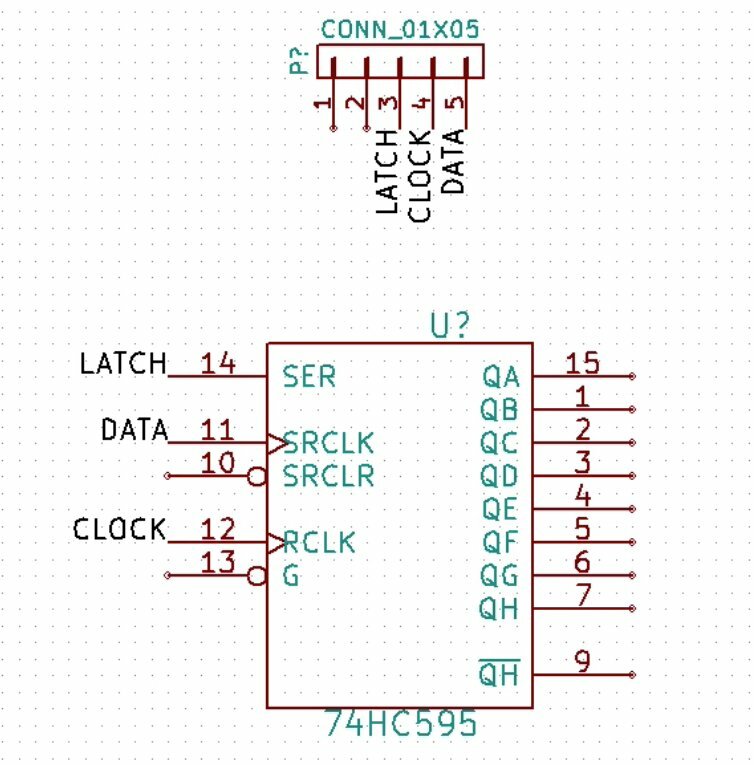 On the IC, we want pin 12 to be connected to pin 4 of the connector, so we will also label it “CLOCK”, just like we did with the connector. The IC pin 12 is also labeled “CLOCK”. This way, IC pin 12 and connector pin 4 are electrically connected (they share the same label). We now have two pins with the same label, and as a result, these two pins are electrical connected even though there is no visible wire in the schematic. Repeat the process for label “LATCH” as per the image above. We still have drawn no wires in the schematic, but we already have three completed and valid connections. Let’s work on the power connections now. On the connector, I would like to attach Vcc to pin number 1 and GND to pin number 2. There are dedicated components for GND and for VCC. Type “A” to bring up the component chooser. 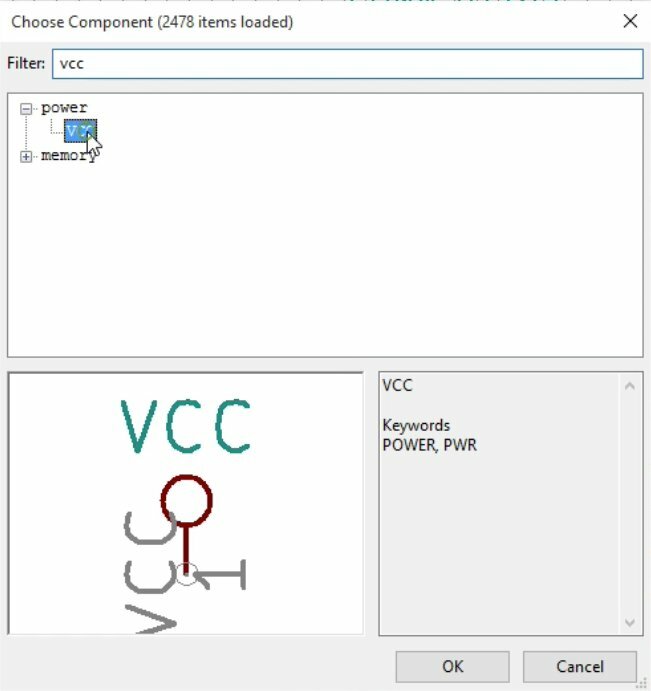 Use the filter to find the Vcc component. Double click to add it to the canvas. Rotate the GND and Vcc components and wire them to pins 2 and 1 of the connector respectively. 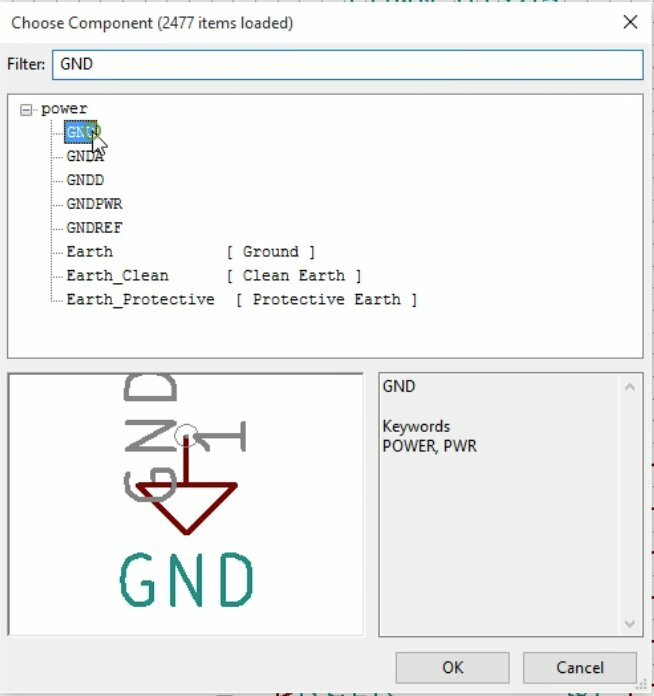 Use the filter to quickly find the GND and Vcc components in the component chooser. Double click on each component to select it and drop it on the canvas. Move them to a position adjacent to the straight connector, and use wires to connect GND to pin 2 of the connector, and Vcc to pin 1. 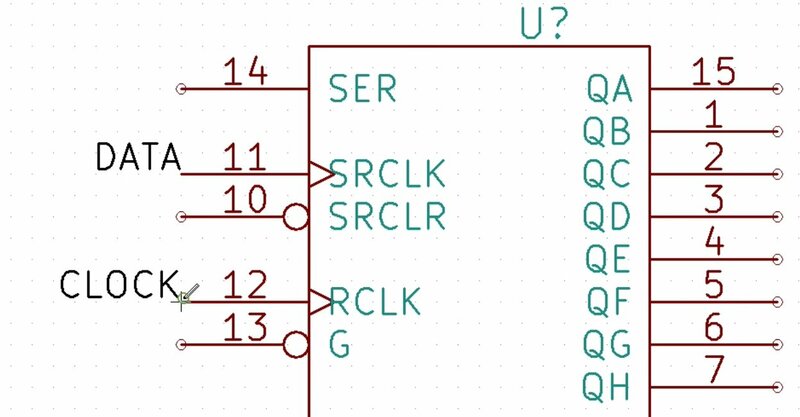 Repeat the process and connect Vcc to IC pin 10 and GND to IC pin 13. 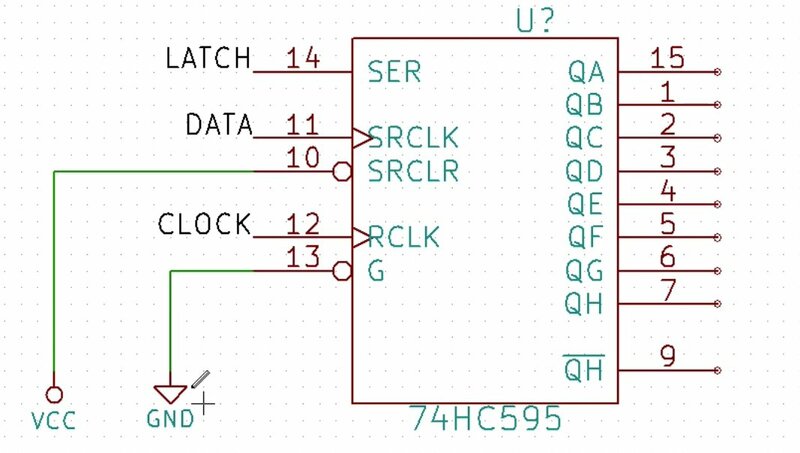 I could have used the existing GND and Vcc components, but this way creates a cleaner schematic. Repeat the process for the IC. 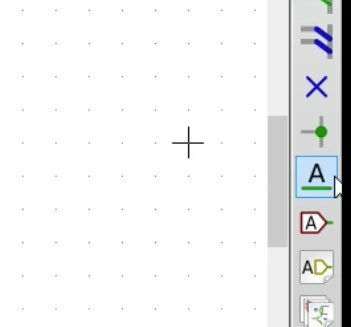 Add a GND and a Vcc component, and wire them to pin 13 and pin10 respectively. 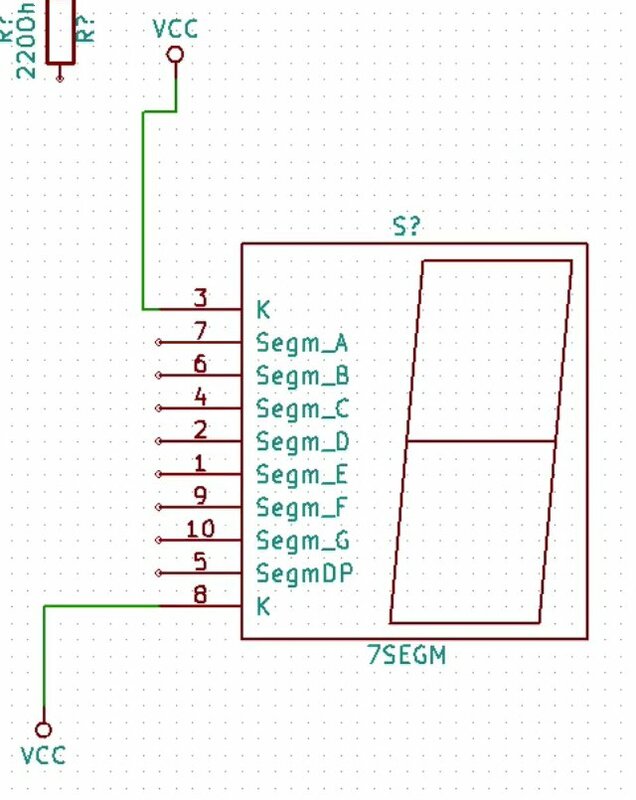 Finally, add Vcc and GND connections to the seven segment display component. To finish the wiring of the Vcc net, go to the seven segment display. Add another Vcc component, and wire them to pin K, like in the image above. The connections for the Vcc and GND nets are now complete. We have also used labels to connect three of the connector pins to three of the IC pins without using visible wires. This helps us to create a clean and easy to read schematic. In the next chapter, I will discuss the concept of hidden pins and the power flag.